Popular singer, David Adeleke, also known as Davido, has reacted to the announcement by the Independent National Electoral Commission, INEC, declaring the just-concluded governorship election in Osun State inconclusive. Davido’s uncle, Ademola Adeleke is the Peoples Democratic Party’s candidate in the election. During the Kogi state bye- election On the 11th August 2018 the candidate of the All Progressives Congress (APC), Alhaji Haruna Isah, was declared winner Isah scored 26, 860 votes to defeat Alhaji Bashir Abubakar of the Peoples Democratic Party (PDP), who scored 14, 845 votes. The margin was 12,015 About 19,960 votes from 17 polling units were cancelled. Here too the cancelled votes were more than the margin but INEC went ahead to declared the APC candidate winner. 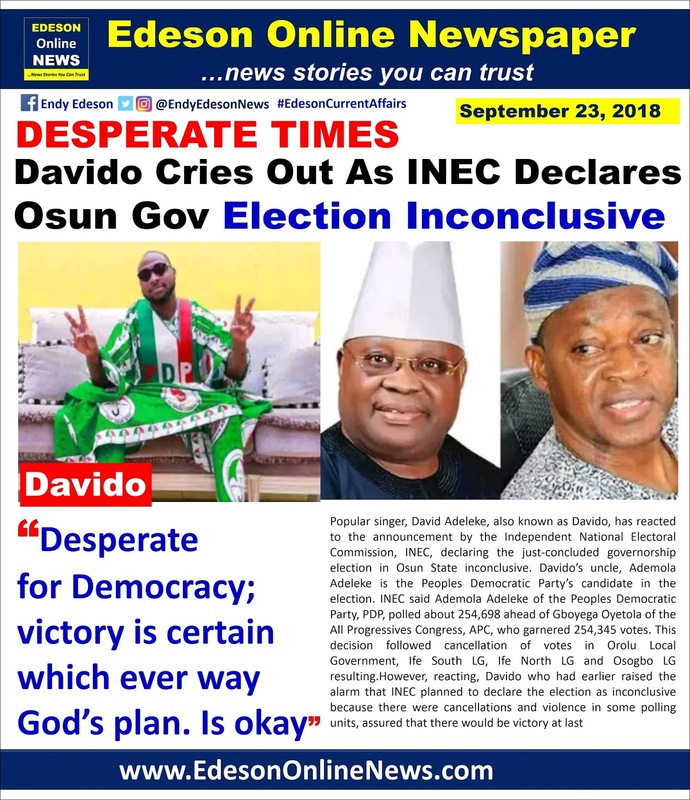 Why was the election not declared inconclusive? It happened in Kogi, IMO and Anambra State. Heaven did not fall. Rocha's was leading with 2000 votes in IMO State in 2011 as an APGA candidate contesting against PDP, it was declared inclusive but he later won. In 2015, Rocha's was leading with 3000 votes as a seating Governor under APC, it was declared inclusive. He later won. In Kogi, Prince Abubakar Audu, was leading it was declared inclusive and APC won. So PDP should go and study the electoral act as well as the constitution before confusing their followers. my question is, what has the apc led FG. done diffrently from the previouse govt. in terms of corruption/election malpractice? those of you justifying the action of the FG. over the osun election should wait for 2019.and then cast your mind back to what in the 2015 general election! my take is, if any govt should do this, it shouldnt be a govt who came with the change mantra, and mandate to eradicate corruption! i wonder what will happen should PDP win the 2019 presidential election?